So if you have been reading my blog for a while or follow me on Instagram then you will know that I am a HUGE coffee fan. I don't drink a lot of it by any means, maybe 1-2 cups a day, but I'm always looking for ways to get that energy boost but without the coffee jitters. On a side note I also love hot lemon water if I wake up super early, I think it's a great way to start the day. 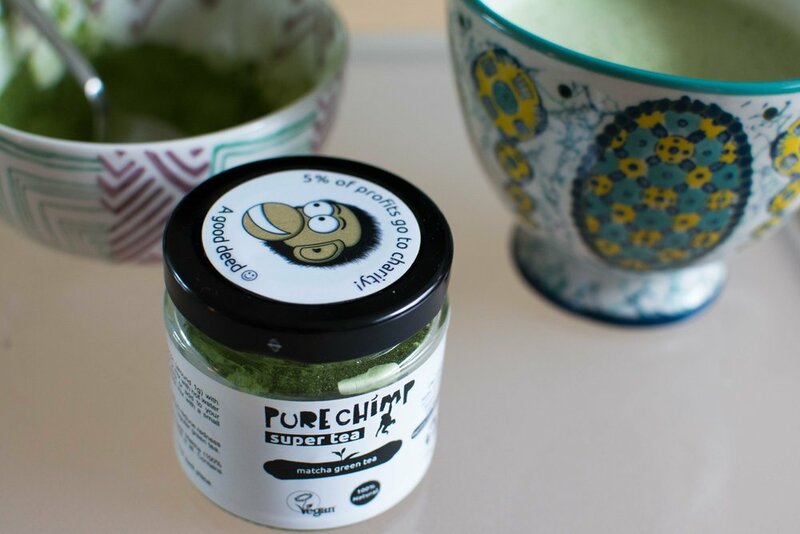 The guys over at Pure Chimp offered to send me a pot of their Super Tea aka Matcha Green Tea which is vegan friendly, 100% natural and ceremonial grade matcha green tea powder from Japan. I have tried matcha tea before and I always ended up just chucking it in my smoothies but I wanted to explore making lattes. So today I am sharing with you how to make a dairy free matcha tea latte in the video below. For the method - watch the video! This post is sponsored by Pure Chimp. As always I only accept items for sponsored posts that are a natural fit, and will not post about anything we don't believe in or wouldn't normally purchase. All opinions are my own. PS I have just added a new workshop to my schedule. Join me for a beginner arm balance workshop in Bristol on September 26th.